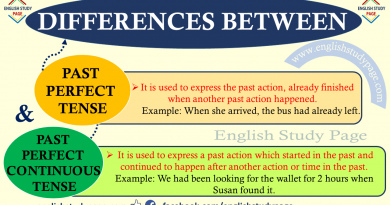 Simple Past Tense indicates an action which is completed at a definite time in the past. ATTENTION! 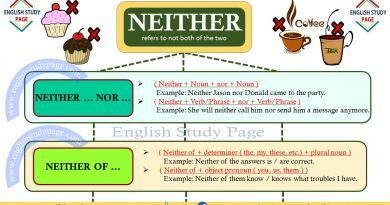 Any auxiliary verbs aren’t used in positive sentences and the second form of the verb is used. ‘ Did or did not’ is used as a auxiliary verb in negative and question sentences and the verb remains simple. Ago / Yesterday / Last week, night, year, summer / Two days, four years ago/ In the past / The day / before yesterday / in 2000 / in September, etc. Didn’t they go to the party yesterday? She didn’t read the book. He drew beautiful pictures last week. I learnt Spanish last summer. Did you give the present to your friend? Yes, I did. We didn’t buy a new car. We also use a question word (Who, What, Why etc.) in past tense. When did she go to the school? Who gave you this gift ? 1. Simple Past Tense expresses completed actions in the past. They walked on the beach yesterday. I met him when she was in London. He went to Paris two days ago. We saw him Last Sunday. I heard a terrible explosion last night. When she arrived the home, your son was reading a book. Lisa watched a romantic movie yesterday. Did you visit your grnad father? Didn’t she study very hard for the exam? We didn’t enjoy the trip. Michael wrote her a letter last week. They didn’t forget to turn off the light. Paul answered the question correctly. 2. 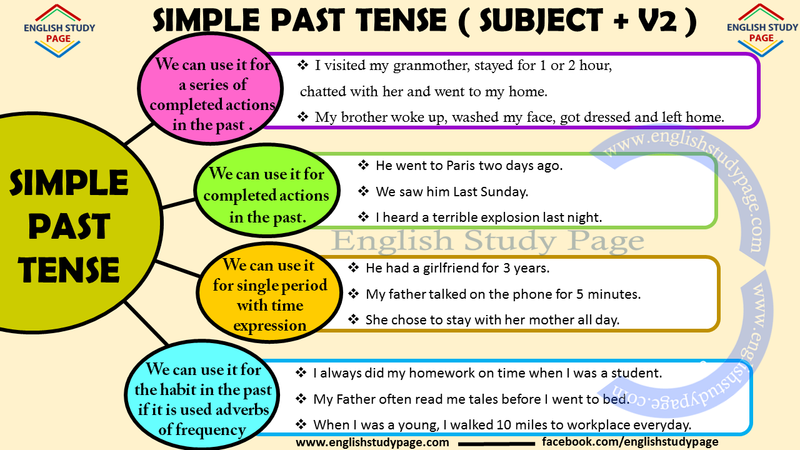 Simple Past Tense expresses a series of completed actions in the past . I visited my granmother, stayed for 1 or 2 hour, chatted with her and went to my home. My brother woke up, washed my face, got dressed and left home. He arrived at the airport at 9:30 am, took her from the airport and came home at 14:00 pm. 3. 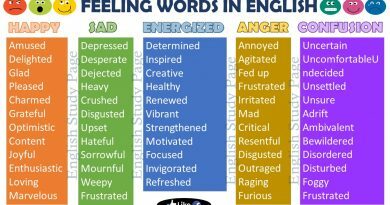 Past Tense expresses single period with time expressions such as for 1 hour, for five years,” all day, a whole weekend, etc. I didn’t see him for 2 days. He had a girlfriend for 3 years. The students didn’t answer their teacher’s question for 10 minutes. She chose to stay with her mother all day. My father talked on the phone for 5 minutes. I always did my homework on time when I was a student. My Father often read me tales before I went to bed. When I was a young, I walked 10 miles to workplace everyday. He usually played football in this garden when he was a child. They sometimes drank milk after they got up. To change regular verbs into its past tense form, we add -d, -ed, or -ied at the end of the verbs according to their last syllable. General Rule: Regular verbs become the second form, taking most commonly ‘–ed’ at the end of the verbs. However there are some exceptions to the rule. These are stated below. 1. If the verb ends with ‘-e ‘, we add ‘ –d ‘. 2. If the verb ends with consonant + vowel + consonant, we double the final consonant and add ‘ –ed ‘. 3. If the verb ends with W, X or when the final syllable is not emphasized, We do not double the final consonant and add ‘–ed’. 4. If the verb ends with two vowels + a consonant, we do not double the final consonant and add ‘–ed’. 5. If a two-syllable verb ends with consonant + vowel + consonant, we do not double the final consonant when the stress is on the first syllable and add ‘–ed’. 6. If the verb ends with consonant + vowel + ‘-l’ , we normally double the final ‘ –l ‘ and add ‘-ed’. However, in the United States (US) they do not double the ‘-l’ when the accent is on the first syllable. 7. If the verb ends with two consonants, we do not double the final consonant add ‘-ed’. 8)If the verb ends with a consonant + ‘-y’ , we throw the final ‘ –y‘ and add ‘-ied’ at the end of the verb. 9. If the verb ends with a vowel + ‘-y’ , we throw the final ‘ –y‘ and add ‘-ed’ at the end of the verb, not ‘ied’. As you can guess from the name of irregular verbs, it does not depend on any rules.